The most absurd part of my work day is when 3:00 rolls around each day and my office has "Snack Time" in the break room. I've discussed it before and most of the time, the snack is just fresh popped popcorn (which I pass on), but on occasion, there's something in there that is worth grabbing and that's what leads me up to this review of the Fiber One 90 Calorie Chocolate Fudge Brownie. I obviously didn't pay for this, but I have seen boxes of them in the store where they cost roughly $3.00 or so for six brownies. This brownie itself is 90 calories (DUH, it's in the name!) and comes in at 0.89 ounces. Being that fiber is the aim here, the brownie also supposedly accounts for 20% of your daily fiber if you are on a 2,000 calorie diet, so it can definitely help you down in the nether regions. As you can see on the packaging above and also in the picture of the brownie itself, Fiber One has done an excellent job of re-creating a brownie with this product. In fact, it smelled entirely like a brownie with a wonderfully strong chocolate smell. The bar was soft and pliable like a fresh brownie (although not warm since it was pre-packaged) and was topped by a decorative chocolate fudge swirl. The brownie itself also had several "chocolate flavored" chips in the mix as well. I'm not sure what differentiates a "chocolate flavored" chip from a regular chocolate chip, but being that the ingredient list and wrapper made special care to point out that they were only chocolate flavored, I'll just go ahead and take their word for it that there is some sort of noticeable difference. Biting into this, I could easily say that this tasted like a real brownie too. One note is that it as softer than a typical brownie, but being that I prefer my brownies more toward the soft and undercooked side than the crispy and crunchy side, I very much liked they way the composition of this one felt. The chocolate flavor was just like the smell in that it was also strong and there was no mistaking that you were eating a chocolate product here. The chocolate flavored chips also did as they were named and they added a nice little pop to each chew as I made my way through the brownie. After the initial pop, the chips quickly melted and coated your mouth and throat with their flavor. In its totality, this brownie was all chocolate, all the time and for those chocolate freaks out there like me, that is definitely not a bad thing. The brownie, along with the chips, coated my entire mouth and throat and left a wonderful lingering chocolate taste that I enjoyed for a quite a long time in the afternoon. Buy It or Fly By It? 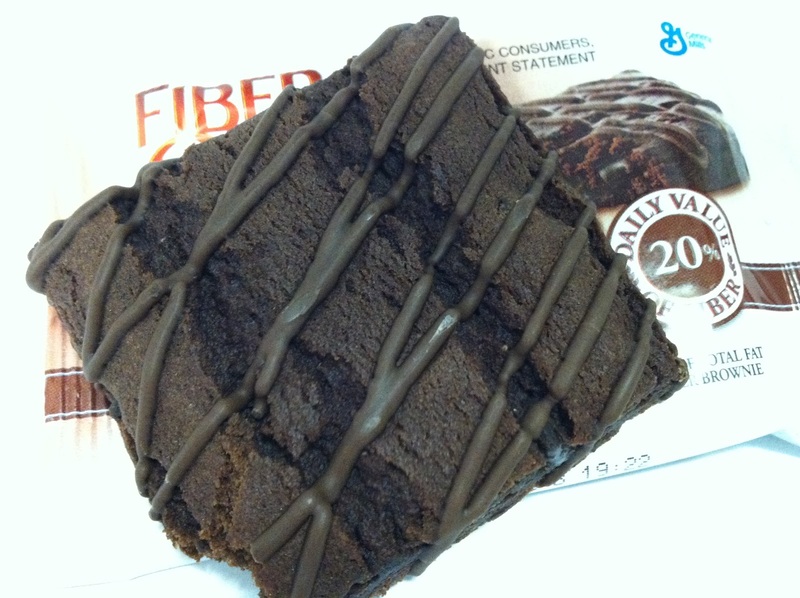 I've got to hand it to Fiber One on this one because this brownie was absolutely delicious and gets a BUY IT rating. 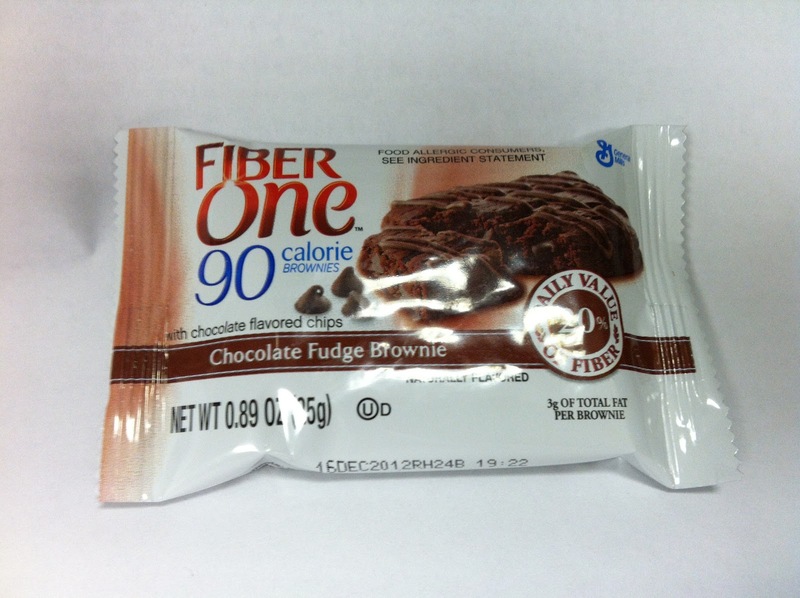 I wish it was larger, but if it was, it would obviously have not been 90 calories and being that Fiber One was going for a low calorie snack/dessert treat by limiting the size, I really can't complain without sounding like even more of a moron than I usually do. So, if you want a wonderfully chocolate and low calories snack time treat (or even a dessert) pick up a box of these bars when they are on sale (they are a bit pricey at regular retail price) and I believe you'll enjoy this as much as I did. I agree that these brownies are good. Have you tried them heated up? Have never heated one up, but that is a really good idea! Thanks! you're welcome. Tell me how you like them heated. Ice cream sounds good with it. =) Or, dulce de leche or peanut butter. Tried doing this last night with some whipped cream on top...outstanding and delicious. Nice. nice. I'll have to try it with some whipped cream some time. Looks delicious! I would so love to try some. Have you tried the met-rx super chocolate fudge brownie? Probably one of the best mass produced brownie bar on the market in my opinion. Interesting. Have never tried that one. You know whats really good? Heating it up for 30 seconds and topping it with a scoop of vanilla ice cream. Party in the mouth! That sound delicious and I just saw in my weekly grocery ad that Fiber One bars are on sale this week. I believe that a shopping trip may be in order!